Will Race-Based Trolling Save the Republicans in Virginia? Ralph Northam’s handshaking flub proves he’s racist! No, but it’s providing some eleventh-hour amusement. State Sen. Ralph Northam, a Democrat with an inspiring biography but boring stump style, is cruising to a win over Republican preacher/grifter E.W. Jackson. An Oct. 31 candidate forum ended with Jackson and Northam tackling a question about gay rights. Northam said he believed in equality for all—Jackson interrupted to say that civil rights and gay issues were totally divorced. As the debate ended, Jackson reached over for a handshake, tapped Northam to get him to notice, then gave up. Cue: outrage. 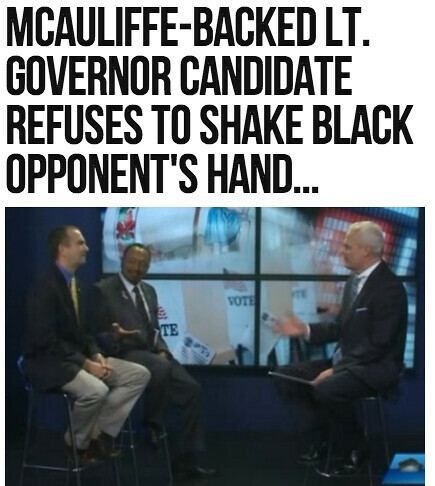 In this story, Breitbart News tells us that “civil rights leaders” (Alveda King and Ken Blackwell) are condemning Northam. “Virginia voters need to decide if that disqualifies Ralph Northam from being lieutenant governor of the Old Dominion,” says Blackwell. At Virginia Virtucon, the question is whether Northam is clueless or “racist.” Bearing Drift, another Virginia blog, takes a lighter tone, but the point is that conservatives nominated Jackson at their convention in part so he could make Democrats look like they hated an independent-minded black guy.